Whether you are just starting to get excited about watercolour sketching or have been sketching for a while now and looking at new materials to add your sketch bag, this post might help you decide. This is one of the first few watercolour sets I got, after I had already tried and tested making my own travel watercolour kit [will write about that in the next blog]. This is mainly about the Daler Rowney 18 colour watercolour Travel kit. This is a fairly decent buy with the cost being 1,588 INR. Two removable mixing cups. * Convenient hinged-lid tin with carrying strap. This is Aquafine range which is the Daler Rowney student grade watercolour. 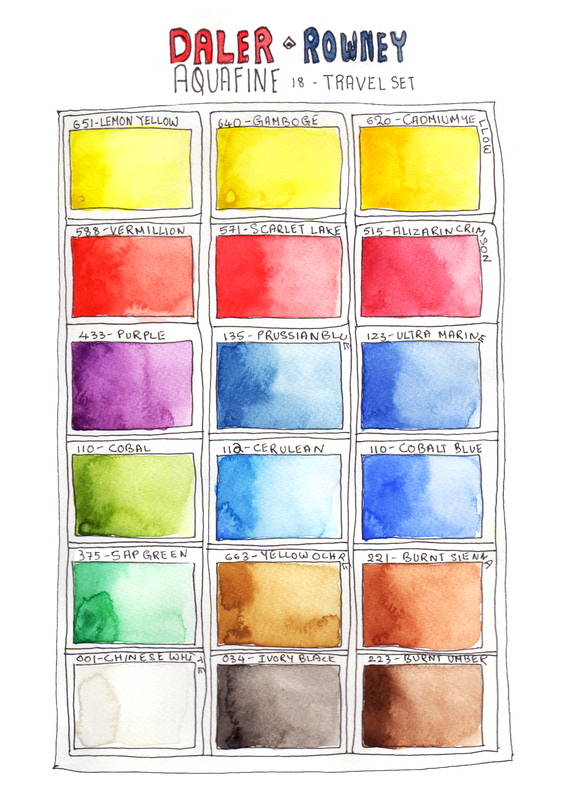 This is a good starting point into the world of watercolour sketching. First of all the box itself is round and looks good and is quite comfortable to handle. If you prefer the ones that can slip into your pocket this is not the set for you. The size of the box is 14 cm diameter. It has a strap to help hold the box when your sketching on the streets or doing plein air. There are two removable cups, split into two sections each, leaving you with 4 places to put water and mix your colours. The cups are easy to detach and wash and re attach. The downside is that the cap of the box has a plastic round attachment which comes out after a while , so I have taped mine with cellophane. Now the quality of the colours itself. There are 18 colours in this set which is more than most other watercolour sets at this range, except for camel watercolour cakes. The Yellows are quite vibrant but can be a little opaque. There are enough blues to help you mix your exact shade. The Cerulean is really opaque and doesn’t stain well and the real main downside to buying this set. The browns are nice and rich. The reds are very good too and stain well. The viridian is good but Sap green is a little muddy for my taste but could work really well for others. And like most boxes there is white and black which most watercolour artists never use, but it is for the artists who like to do work with opaque touch or in illustration style. I really liked the brush that comes with this set it is rather good and useful, it fits right into the box, I usually carry a few more water brushes along with this but if you are not the water brush kind you can just go with the brush in this set.